I love the trend of rustic. When you have old furniture, you scratch it even more and call it a rustic patina and when you sew like I do, people call it homestyle. 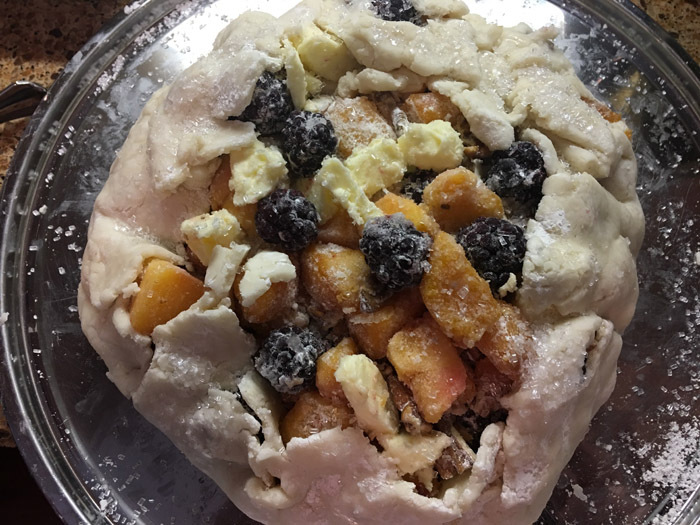 Making this rustic blackberry peach tart started me thinking about all of the ways we are forgiving our imperfections these days. I personally love it because I don’t like hem lengths or color palettes dictating what I wear or how I decorate my home. Consequently, out with the “greige” and in with chartreuse, pink, or whatever color you want. If you don’t want to crimp a pie crust, who cares? Toss it on a cookie sheet and call it a rustic tart. We think this rustic phase is all trendy with our 2k freewheeling lifestyles, however rustic food actually harkens back to the days of nobility and of course, peasants. The people who lived off the land were the first people to eat “rustic” food. Simply put, rustic food was homemade food with seasonal and local ingredients such as potatoes, beans, and the occasional piece of meat. Nowadays, our food is ultra-processed so when we eat a simple peasant meal, we give it a clever rustic title to differentiate it from the grocery store inner aisle junk food. If you have fruit in the freezer like I do, then this Rustic Blackberry Peach Tart is a quick recipe. 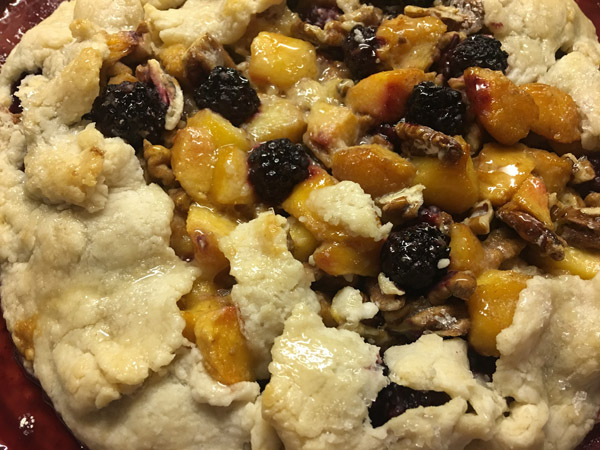 I used my basic double pie crust recipe and the frozen fruit I had picked last summer. Since I don’t have a vacuum sealer for my frozen foods, I noticed that some of the fruit is getting a little bit of ice crystals on them. I knew I needed to start using them up before I lost them to freezer burn. Speaking of PDQ, which for me, stands for pretty darn quick, I am going to recommit to writing on the blog again. As I mentioned in a previous post, I don’t exactly write the way the search engines want me to and when I try to fix it, the post doesn’t sound like me anymore. (Maybe that’s their point.) This revision process takes a lot of time. With this post, however, I’ve decided that I obviously have “rustic writing” and I’m just going to go with it. I’m clearly a peasant and I’m okay with that. 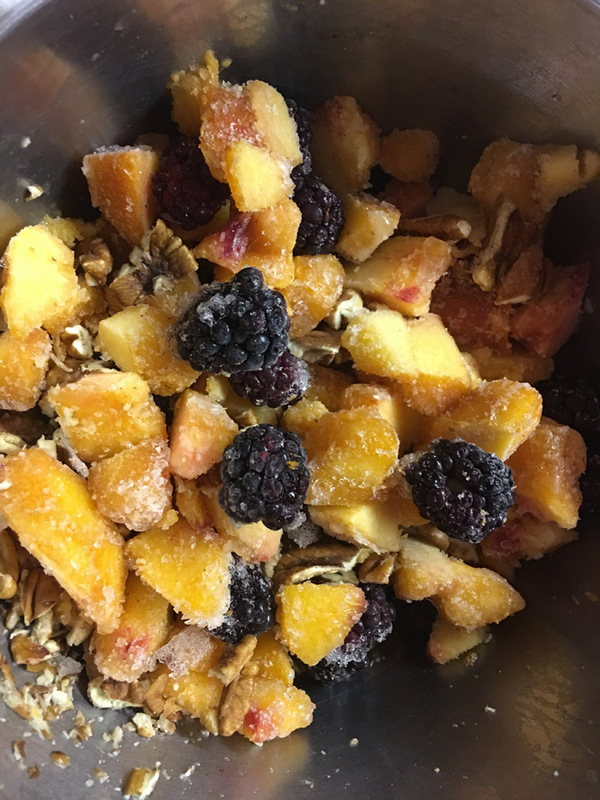 In a bowl, mix together the peaches, blackberries, nuts, sugar, and flour. 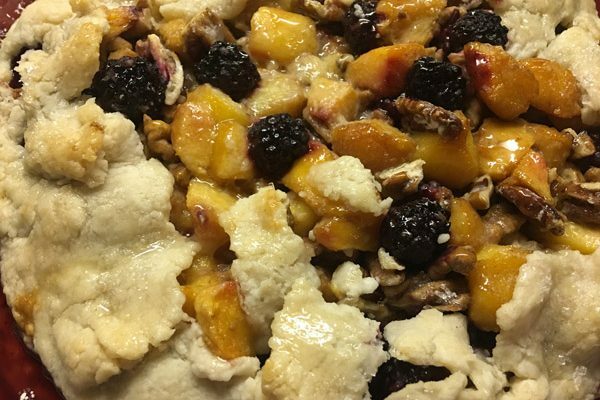 Pile fruit in the center of a pie crust placed on a baking sheet. Dot fruit with butter. Pull the sides of the crust up the sides of the fruit. Bake at 375 degrees until crust is golden brown, about 45- 60 minutes; remove from oven. If desired, brush with melted jelly for a glazed finish. 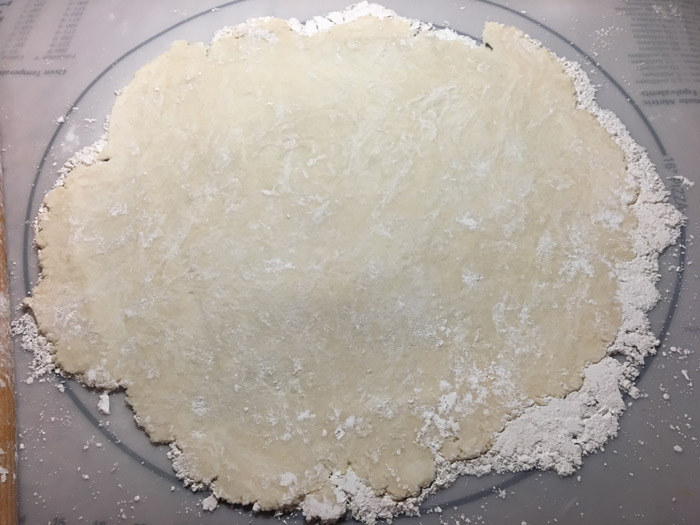 Roll out your pie crust. Mix together the fruit, nuts, flour and sugar. You can adjust the flour and sugar according to the juiciness and sweetness of your fruit. Dot with butter and pull up the sides. You can serve this tart warm from the oven with ice cream.